I had a conversation with Connor last week. About timelines. I told him that he does not have a choice: he will keep a timeline for his high school years. Period. I explained to him my thoughts about timelines. Basically, I want him to have a reasonably permanent record of his high school history studies, and I think there is a lot of value in having some type of book where you can be making associations between things going on in various parts of the world, or in different spheres -- what types of music might Napoleon have listened to, for instance? He reluctantly agreed that there probably is some value in a timeline, but still insisted he didn't want to cut, paste and assemble (you do know that is what CPA really stands for, don't you?) We agreed to spend some time next week (in other words, THIS week) researching some possibilities and picking something. So what should appear in my inbox this morning? 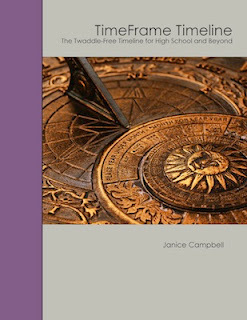 A link to a new product from Janice Campbell. TimeFrame: The Twaddle-Free Timeline for High School and Beyond. Can you believe it? There isn't a lot up on the website yet... but we love her English 1. I want to see samples or something before I shell out $30-ish on this (with shipping). But he liked the looks of it. Twaddle-free was a big selling point. So... what do you use? What do you like about it? What don't you like? I'm very, very tempted to get that planner, but I'd love to see more pictures. I really like the way that it shows the entire length of something. I struggle with our Book of Time b/c the pictures don't always help you see who overlaps what.